What a difference a couple days make. And no, for the record, I don't mean a couple of full nights of sleep. Because that isn't happening. Even when I sleep on the floor of my wee man's room to keep him company in the dark. And it melted my temporarily sleep-deprivation-induced icy heart. It isn't often that I get to see myself in the moments of pure joy and peace that motherhood brings me, but this picture captured one. It was exactly what I needed to take a step back. And count my blessings. You know, for better or for worse (and I truly do believe, for us, it was better), cosleeping was a choice my husband and I made when our son was small. It isn't Little Spaghetti's fault that we're outgrowing it, and I have to remind myself that this transition is probably hardest on him. So, really, I shouldn't complain. Tonight's a glass half full kind of night. These are the moments that make a mom. Blogger Idol and Corsets (plus a giveaway)?!? What a day! So, if you're going to enter the giveaway (which you should), just be warned that you'll be competing against me! But, if I don't win, I hope you do. I have a million corsets. It's kind of like an obsession. I don't even remember how it happened, but one day I stumbled across this Facebook page (if you clicked the link, make sure to like the page and tell her 'My Husband Ate All My Ice Cream' sent you! ), and I fell in love. Then I realized... I have all these corsets sitting around, but I don't LOVE any of them. There's some sort of issue with each one, whether it be ill-fitting, not very good quality, no modesty panel (the fabric panel that is behind the laces), etc. And while they were cute, none really gave me that figure I was looking for. I messaged the company, and asked about doing a review of one, just to see what the difference, if any, there really was when a corset was handmade, and made custom to your measurements. It was totally by surprise that she agreed, and even said she'd do a giveaway for one as well! This isn't even all of the options. She gets in all kinds of fabric all the time, and some, she only has enough to do ONE corset in. So you'd be the only person in the whole world with a corset of that fabric! I sent her my measurements, and picked the shape of the corset I wanted from the site. I was worried though, because I picked a longer style (The Renaissance), and I'm only five feet tall, and I was worried it would be too long. But... it was no problem. 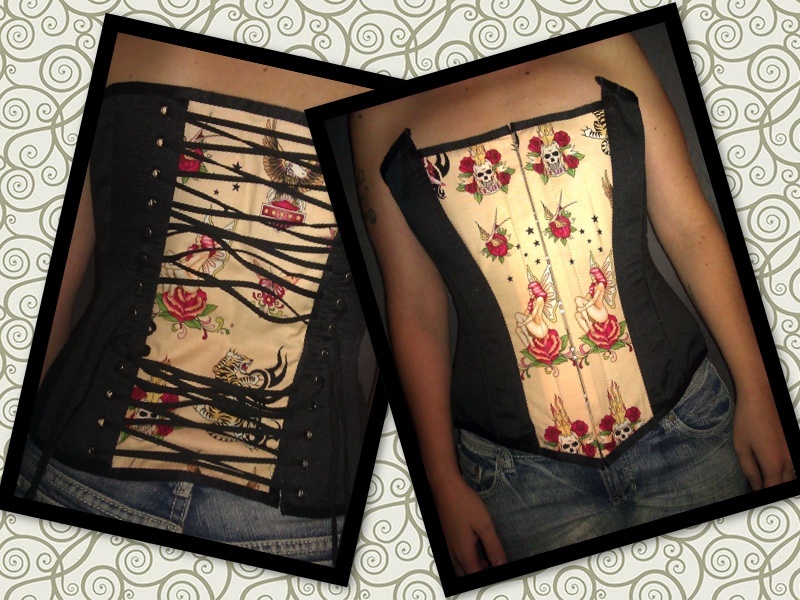 Since each corset is handmade, she just used the style I wanted, and shortened it up a bit! Then came the wait... she had to make it, and it had to ship all the way from England. I was thrilled when she sent me pictures when it was all done, but it did NOT do the corset justice at all! You guys, I can not even BELIEVE the quality of this thing. First, it has real steel boning in it, which means that it is sturdy. 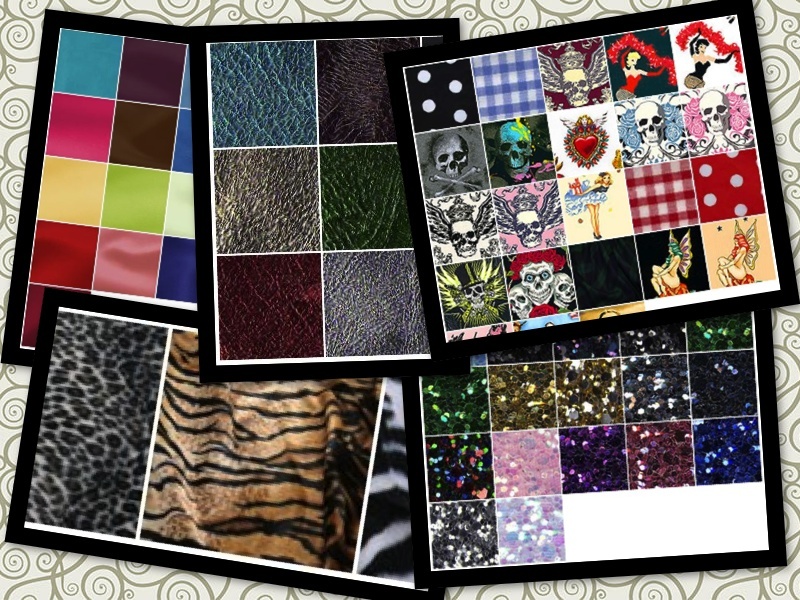 Then, the fabric is NOTHING like the ones you get from lingerie stores. This is much more elegant. The satin is like the fabric you would see on an expensive wedding dress. You can even tell just by holding it that it isn't cheaply made. It's heavy, just like a well made dress, and you know it's going to do the job. Huge difference, right? And it was so much more comfortable than the cheap corsets too. I could also tell a huge difference in what it did for my waist and cleavage, compared to the cheap ones. One cool thing is the way they lace up. Instead of the lacing going all the way from the top to the bottom, they meet in the middle. This way, you can tighten it up from the top, and the bottom separately, ensuring that your fit is going to be perfect. 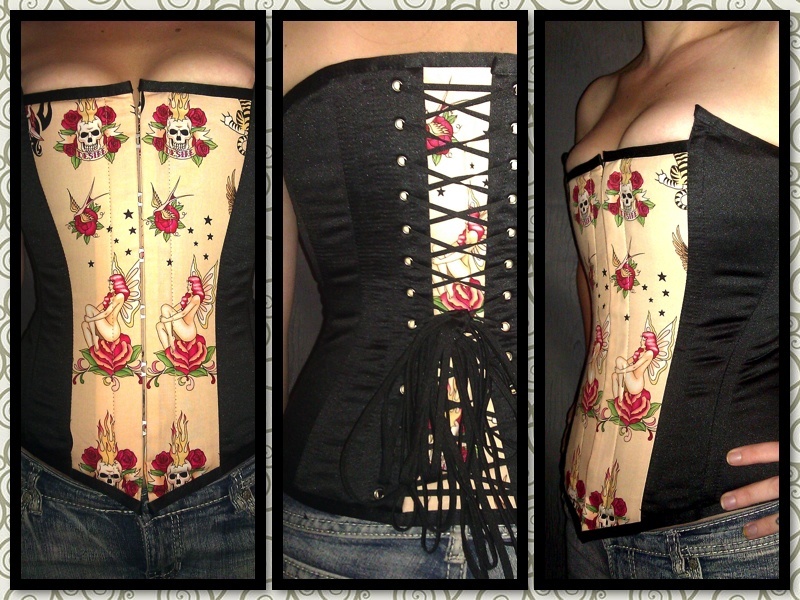 She also sent me (as a surprise) an underbust corset to try out as well. I was a little nervous, because I had never worn one, and didn't really know what to think. 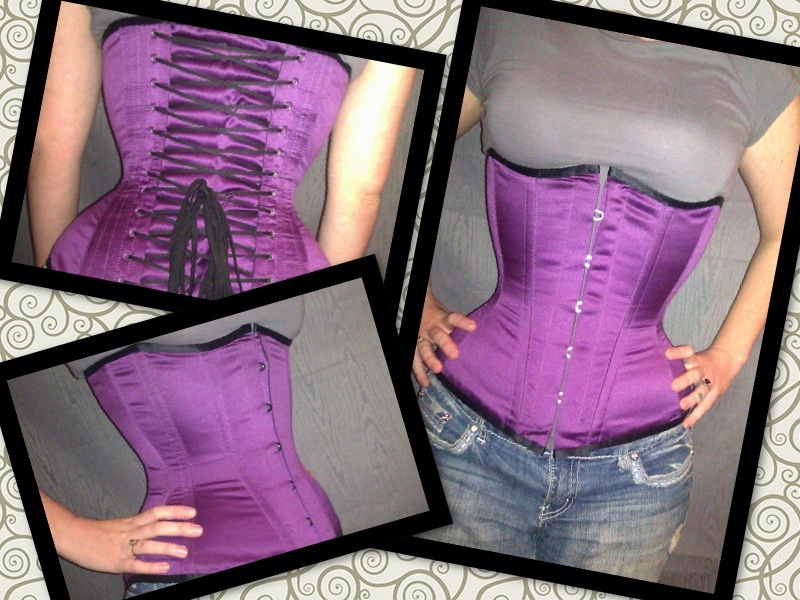 I learned one thing really quick though: It's a lot easier to get an underbust corset REALLY tight (thank you hubby). I think the nicest thing about corsets, besides the fact that they can make any figure look gorgeous, is that they are so universal when it comes to fashion. They can easily be dressed up or down to accommodate for any occasion. 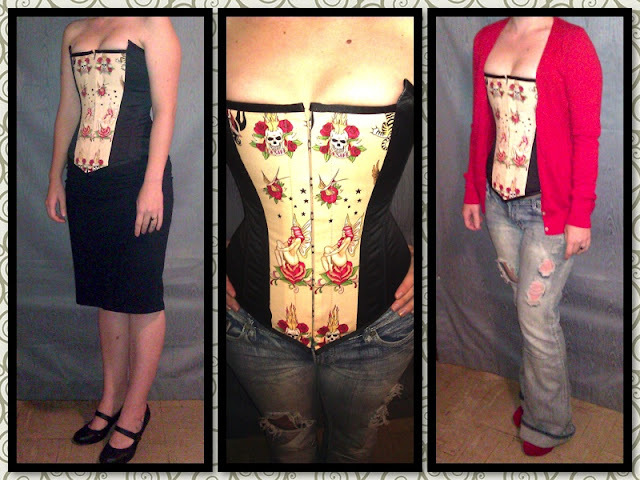 Ladies, if you love corsets as much as I do, I am urging you to save up to buy a corset from Booby Trapp Corsets. If I could trade in the whole collection of corsets I have and only have a couple corsets from Booby Trapp Corsets instead, I would do it in a heartbeat. For the cost of a couple of the cheap ones, you can have an amazing one. One of you isn't going to have to wait until you can save up though, because Booby Trapp Corsets is giving one of you a chance to win one! The giveaway starts today, and will end on October 2, 2012, at 11:59 PM. 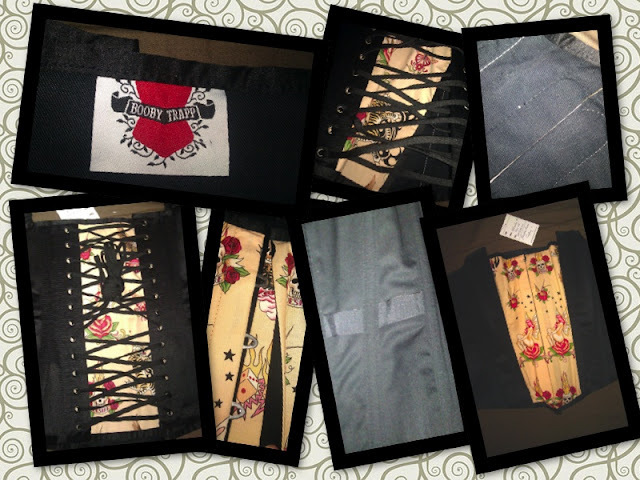 The lucky winner will get to customize their very own made-to-order (or 'bespoke', as they call it overseas) corset! It's super easy to enter, and all entries will be verified before a winner is announced! If you don't see the rafflecopter form below, just refresh the page! So, the very first time I ever did a giveaway, it was for $100 cash. I loved that giveaway. It was seriously fun. And I've often thought to myself, "Boy I'd love to do that again." Sadly, I don't often just have a hundred bucks laying around to give away. Almost never, it turns out. But then I learned about something called group giveaways, where I can horn in on someone else's awesome giveaway in exchange for helping them promote it. I think that's pretty darn clever. So, in October, I will be helping give away $100 cash (and, can I just say now that I hope one of my awesome readers wins it?). And if you want to help, you can join too! Sassy Deals & Steals is hosting a $100 cash giveaway. This giveaway will run from 10/1-10/20 but signs-up are up now so you can get a spot in this great giveaway. One link free, more available for a fee. Check out the details and sign up here. And please tell them The Spaghetti Westerner sent you! My child will not sleep, and you'll never guess what he's afraid of. It's been two and a half years. I'm ready for a good night's sleep. Actually, I'm desperate for a good night's sleep. I love this boy, and by almost all accounts, he's an angel of a child. Except when it comes to sleep. And sleep has never been easy. First, there was the newborn stage and I was terrified of SIDS. We're talking beyond paranoid. So, our baby slept in our room. Then there was the nursing stage, where my baby wouldn't drink from bottles, so he ended up using me as an all-night snack bar. I felt like I was winning though, because at least I was sleeping, even if it wasn't overly restful. Then he got sick. Then my husband was out of town five nights a week. Then we moved to a new house and lived in the dining room for weeks. Then he had a new room. You get the picture. Excuse after excuse for the last two and a half years led me to be one of those parents I swore I'd never be who lets a toddler sleep in their bed. And so I'm making a real, true effort at getting him to sleep in his own bed. My trusty friend Google told me that if I taught him how to go to sleep in his own bed at the beginning of the night, he would be able to put himself back to sleep if he woke up during the night. Guess again, Google. He goes to sleep like a champ with no rocking, singing or coddling. I don't even have to be in the room. But come 2:30 in the morning, there's no option but yelling until I come gather him, his stuffed monkey, his toy bear, his train flashlight, his water bottle, and his two blankets out of his bed and into mine. He's started telling me that he's afraid of things (more like everything). So I started sleeping on the floor of his room. And we were making real progress. Until tonight. Bedtime came and went, and my child was hollering. Uncontrollably upset. "Mommy, I need your help! I need just a little bit of help!" he kept saying. And just what was it that he needed help with? "I'm afraid of the cucumber! The cucumber outside. The CUCUMBER!" he said. This went on for an hour. How do you convince a two year old that cucumbers are not frightening nor are they dangerous? That they can't move or walk or do anything, really? You don't; that's the answer to that question. Thoughts, prayers (for my sanity specifically), and suggestions are more than welcome. Will you be the next Blogger Idol? This time last year, I was in the midst of the Blogger Idol madness. Though, I don't mean madness in a bad way. The competition was intense and crazy and frustrating. But it was also rewarding and fun and amazing. Blogger Idol made me do a lot of soul searching. At times, I relied on total strangers (though, they certainly aren't strangers any more) for my strength to keep competing. I made connections with some amazing people who continue to inspire me. I learned how to take constructive criticism (and sometimes just plain ol' criticism) but not lose myself in the process. And now, it's time for someone else to have a turn. Auditions are officially open. And I really hope you will consider tossing your hat in the ring. I can't wait to find out who will join me as a Blogger Idol. Go audition now! In case you're curious...my audition from last year is below. But I bet you can do better than that! When I was eight, I wanted to be a best-selling author. That's my first memory of dreaming of doing something big. Of making a splash. Of being somebody. After a big-name publisher rejected my first masterpiece, I decided to stick to my Lisa Frank diary, kept safely under plastic, purple, butterfly-shaped lock and key. And so it went. When I was eleven, I wanted to be an Olympic gymnast. When I was in high school, I wanted to be a Broadway star. When I was in college, I wanted to be America's Next Top Model. There was always something in the way, though: I was too young, too tall, too tone-deaf, too nervous. Here's the cherry on top: I am so obscure a blogger that you don't even know who I am. After all, isn't that what Idol is about? Taking someone that nobody's ever heard of who pours their heart and soul into what they do with a little bit of talent and a lot of charisma and introducing them to the world? Today, my friends, is my ten thousandth day alive. I think that's way cooler than a regular old birthday. I was going to throw myself a party, but we just got home from vacation a few hours ago, so that was out of the question. But, I think I'll celebrate with a rum truffle brought back fresh from Barbados. And maybe I'll drink the one beer left in our refrigerator. I can tell you what day 10,001 will hold: grocery shopping. So, Happy 10K Day to me! Want to find out how many days you've been alive? Try this. Because, really, you never can have too many things to celebrate.